John and Lyn Breck 250 pp. 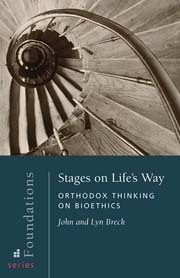 Taking the reader through the stages of life from conception to resurrection, the authors plumb the vital wisdom of the Christian tradition, coupled with pastoral training and an awareness of medical and scientific data, to address ethical and moral issues. Among the topics covered are marriage and sexuality, embryos and stem-cell research, newborns and disabilities, addictions and family systems, and end-of-life care. Students and scholars alike, especially those interested in gaining an Orthodox perspective on a range of some of the most important contemporary ethical topics, should read this insightful book.